On the evening of April 18, 1906, it might have seemed as though the rapid growth of the Christian Science movement in San Francisco, California, had been buried in the ashes and fallen stones of the great disaster. Map of San Francisco reconstruction, April 18, 1908. Library of Congress, Geography and Map division. 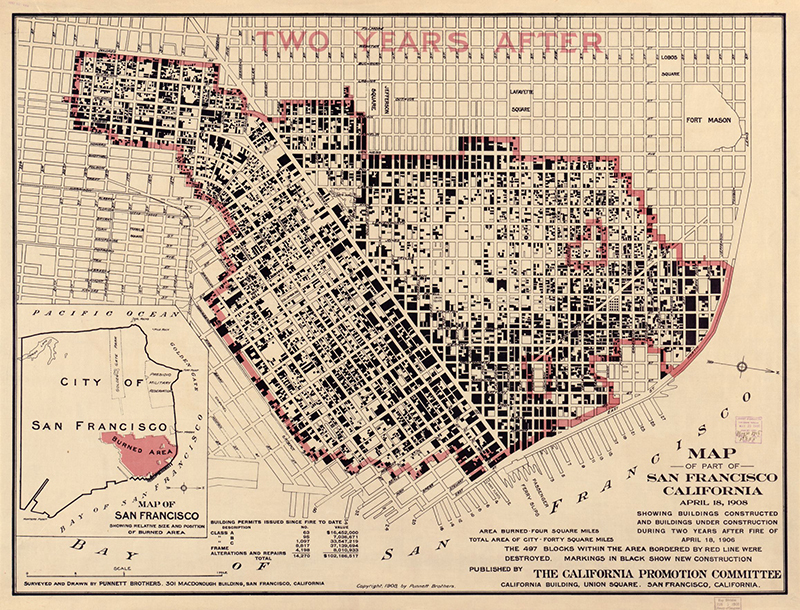 This historic street map shows San Francisco in 1908, just two years after the earthquake and fire. Each black spot represents one of the astonishing number of new buildings within the fire zone, erected or under construction since 1906. Had the map extended a few city blocks beyond the zone, it would likely also have shown the temporary meeting place of First Church of Christ, Scientist, San Francisco, which had been erected just five months after the smoke cleared. In this undertaking, the church was joining in the remarkable city-wide rush to rebuild, their efforts aided by a nationwide flood of generosity. In the weeks following the disaster, earthquake relief committees formed in communities across the country. In Concord, New Hampshire, the Mayor convened a meeting of city leaders to collect contributions. Enclosed herewith is check for one thousand dollars, my contribution to the local fund for the relief of the San Francisco sufferers. Mrs. Eddy was generous in times of public need. But she had a special interest in the San Francisco crisis. In the middle of the fire zone had been one of her students who was close to her heart — a woman who had brought Christian Science to the West Coast of the United States and, at Mrs. Eddy’s direction, moved from her hometown to San Francisco to practice and teach in a broader field. The story had begun in 1884 — the year Mrs. Eddy went West. Meanwhile, a young woman from Illinois, then living in California, was about to play a pivotal role in realizing that hope. Sue Ella Bradshaw had moved to San Jose with her mother and stepfather. She was just twenty-two. She loved the idea of healing the sick, but she was abandoning any thought of becoming a physician. The thought of surgery was off-putting to her, as was medication. Beyond that, however, was what seemed an overwhelming obstacle: she herself was not well, and never had been. In fact, the family had moved to the West Coast partly in hopes that the climate would improve her failing health. Sue Ella Bradshaw circa 1882. Photograph, Longyear Museum collection. In 1884, as Mrs. Eddy was heading west to Chicago, Sue Ella was heading east to relatives in Pennsylvania. In Philadelphia, a family member told her how Christian Science had healed his wife. He urged Sue Ella to look into the religion for her own cure. Liking what she heard, Sue Ella got a copy of Science and Health with Key to the Scriptures, Mary Baker Eddy’s cornerstone work on Christian Science. She sat down and read it from cover to cover three times — in two weeks! — and found herself well. Heading home in September, Miss Bradshaw stopped in Chicago to receive instruction in Christian Science from Caroline Noyes, who had just attended Mrs. Eddy’s class there. Afterwards, brimming with enthusiasm, young Sue Ella boarded the train to California. Arriving in San Jose, her first patient was her stepfather, who was suffering from cancer. He was promptly healed. His granddaughter, who was blind in one eye, also received treatment. In a short time the child could see with both eyes.3 Two healings. Soon there would be more. Christian Science had come to California — in the person of one lone young woman. Over the next three years, Sue Ella traveled three times to Boston for Primary, Normal, and Obstetrics classes with Mrs. Eddy. Back in San Jose, she began teaching and lecturing, and hers was the first Christian Science Institute on the West Coast to advertise in The Christian Science Journal. In 1887, Mrs. Eddy urged her to move to San Francisco to practice and teach a wider field. Sue Ella went where her teacher pointed the way. 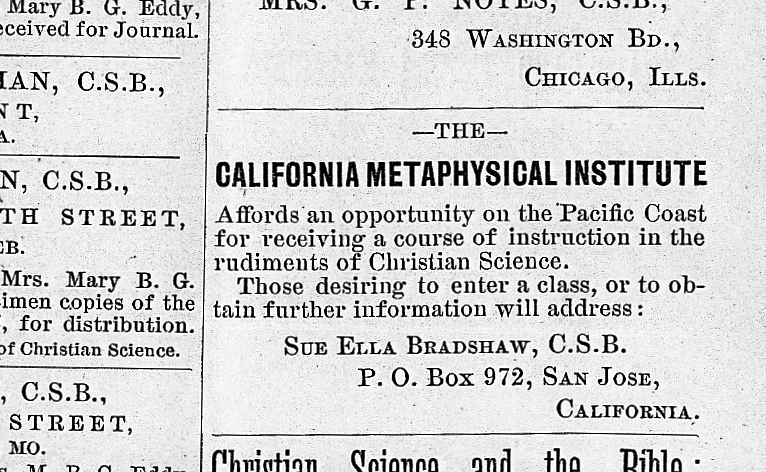 Sue Ella Bradshaw’s advertisement in The Christian Science Journal of August 1886. A single case serves to illustrate a long trail of healings. One night Miss Bradshaw was called to the bedside of eight-year-old Agnes Tillman, who was suffering from what was then called gastric fever. Plagued with this illness since infancy, the child was allowed to eat only a special diet. But the attacks had increased in violence. Noted physicians had failed to relieve her, and on this night, predicted she would not live until daylight. Earlier that day, her father had learned of the Christian Science lady who cured by prayer, and as his little Aggie lay in a fever, he drove his carriage through a pouring rain to Miss Bradshaw’s door. Sue Ella threw on her coat, climbed in beside him, and they drove off. Entering the sickroom, she asked the parents to step outside. They protested, but she was firm. Through a crack in the door, they watched her sit by the girl’s bed for a while, her eyes closed in prayer. At last, she came out and assured them their daughter was all right, and sleeping soundly. She asked to be taken home. “Don’t leave us alone,” they pleaded. Sue Ella insisted calmly that God was there with them and their child was all right. “But tomorrow, what should I feed her?” Agnes’s mother asked. “Whatever she wants,” Sue Ella replied. And she went home. As healings like these multiplied, so did the number of people wanting to learn more about Christian Science. Miss Bradshaw taught, treated patients, and began holding church services in her home on Powell Street. Before long, the congregation filled the large first floor and overflowed up the staircase. In fact, “overflow” became a theme for the coming years. In October 1895, Sue Ella Bradshaw called a small group together to organize First Church of Christ, Scientist, San Francisco. The fledgling congregation proceeded to hold services downtown in the modest-size Beethoven Hall on Post Street near Market. Within two years, that hall was overflowing, so the church moved its services to the larger Steinway Hall at Sutter and Kearney Streets. Within a short time, they had to hold overflow meetings there as well. 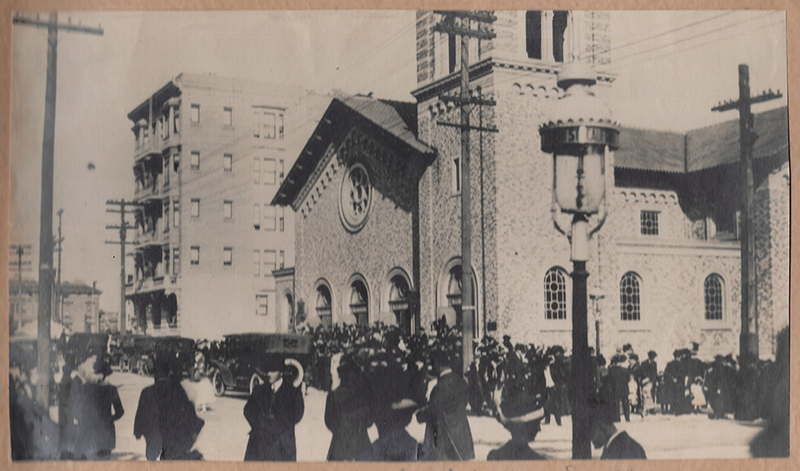 On their lot at Sacramento and Scott, foundation stones had been laid and piles of lumber awaited construction, as congregants flooded into their temporary synagogue/church on Easter Sunday 1906. It was to be the last service held there. Three days later, in the early morning hours of Wednesday, April 18, 1906, the temblor struck. San Francisco’s earthquake and the city-wide firestorm that followed reduced the city’s business district and many residential neighborhoods to rubble. Most of the buildings left standing had no gas, electricity, or running water. The former synagogue where First Church had been holding services burned to the ground. The Reading Room, too, in the Adams Building on Kearney Street, burned, along with all its contents. Meanwhile, the congregation’s church-to-be was little more than a hole in the ground. In the wake of the disaster, half their members joined the exodus of refugees heading elsewhere. But in the midst of the debris, the determination to continue spreading the word of Christian Science remained. So did Mrs. Eddy’s student who had begun it all. 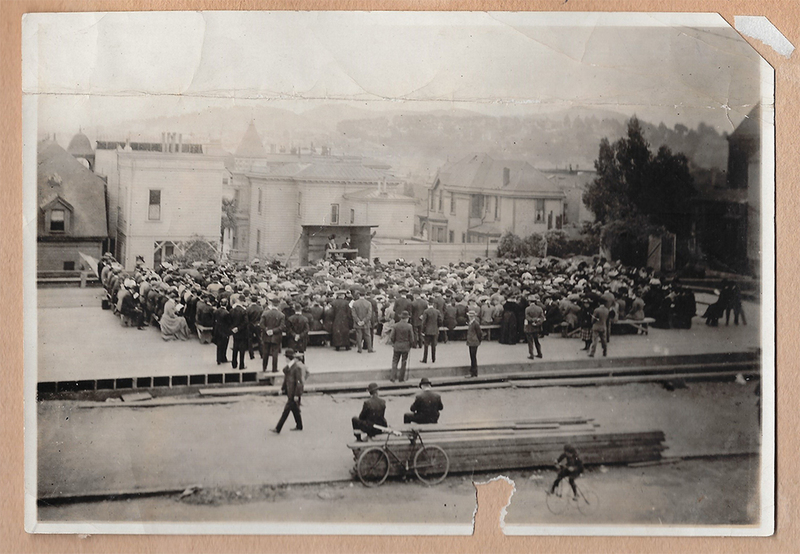 First Church of Christ, Scientist, San Francisco, congregation attends an open-air service on May 6, 1906, its second Sunday service after the earthquake and fire. Photograph, private collection. 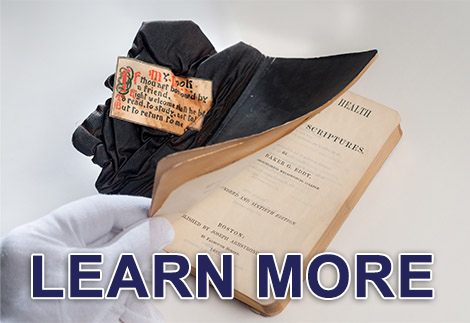 Click here to learn about a special item that survived the earthquake and fire. In San Francisco, too, according to all reports, not one Christian Scientist had been injured. Although there was loss of property, human needs for housing, food, clothing, and jobs were promptly being met. … Notwithstanding the material losses there has been much spiritual gain in a clearer realization of the ever-present good and greater desire for spiritual understanding. I am with a party of nine who are on the way to Boston to participate in the Communion and dedication of the Extension of The Mother Church edifice…. Although the San Francisco membership had been cut in half as people moved away, by 1908 their temporary hall was again overflowing. Accordingly, some of the members left to form Second Church of Christ, Scientist, holding services in the Mission District. Shortly thereafter, another group parted company to form Third Church, meeting in the Park District. Each time people left, their places were filled by newcomers, and the congregation grew. The very next year, in 1909, First Church purchased a new lot for a permanent church edifice at the corner of Franklin and California Streets, on a site that overlooked the nearly rebuilt city. The building committee was led by its chairman, Sue Ella Bradshaw. On Saturday May 6, 1911, a small group gathered quietly in the early morning light to lay the cornerstone. 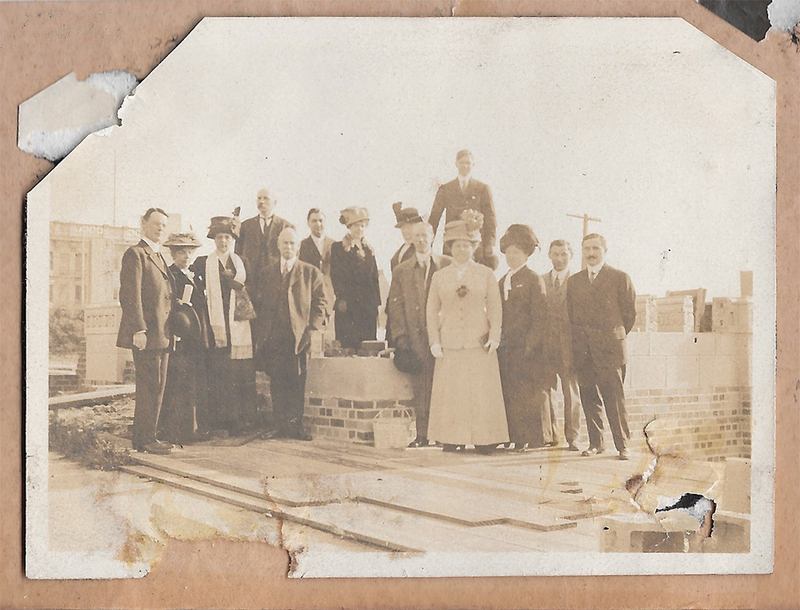 Executive Board members, Building Committee, and Readers of First Church of Christ, Scientist, San Francisco, lay the cornerstone for their new edifice at Franklin and California Streets, May 1911. Photograph, private collection. The occasion was reported on in the May 7, 1911 edition of the San Francisco Chronicle. Congregation attending dedication of First Church of Christ, Scientist, San Francisco, on November 23, 1913. Photograph, private collection. 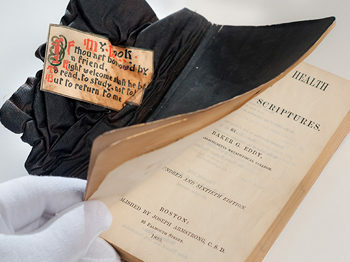 The spreading of Christian Science in the West, which Mary Baker Eddy had hoped for and prayed about — whose standard had been planted by one lone young woman — continued to march forward into the 20th century. “Concord’s Relief Fund,” Christian Science Sentinel 8 (Apr 28, 1906): 549. Reprinted from Concord (NH) Patriot. 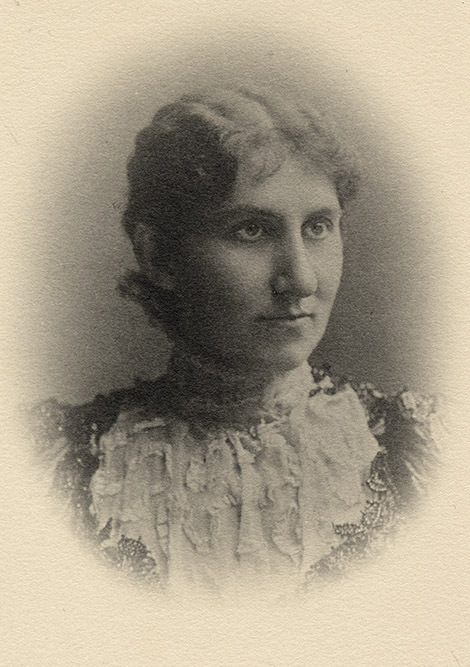 Susan E. Schopp, “Mary Baker Eddy in Chicago, 1884 and 1888,” Longyear Historical Review 37, No. 1 (2000): 3. Eloise Mabury Knapp, A Biographical Sketch of Sue Ella Bradshaw, C.S.D. (San Francisco: privately printed, 1929), 2-5. Biographical Sketch, 12-14. 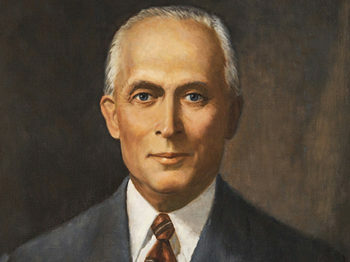 See also Bart R. van Eck, “Life That Maketh All Things New,” address at Arden Wood, San Francisco, California, November 2, 1997. In his talk, Mr. van Eck recounts the healing of Agnes Tillman, the woman who would later become his mother. Dedicatory Address, First Church of Christ, Scientist, San Francisco, November 23, 1913. Private collection. “Among the Churches,” Christian Science Sentinel 8 (May 12, 1906): 582. Reprinted from the San Francisco Chronicle. 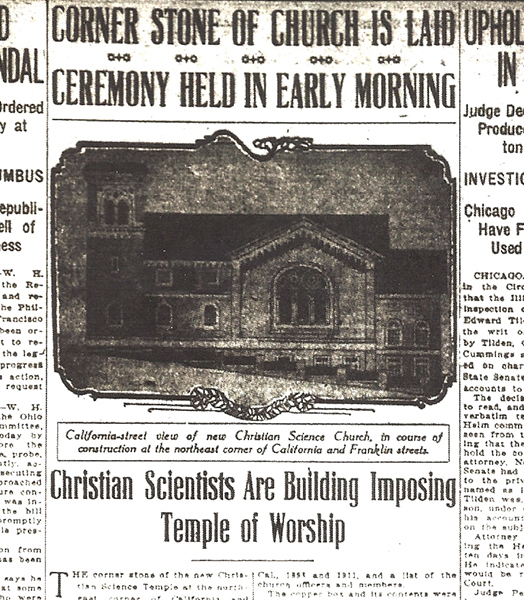 “Among the Churches,” Christian Science Sentinel 9 (Mar 2, 1907): 481. “The Wednesday Evening Meetings,” Christian Science Sentinel 8 (June 23, 1906): 680. Herbert W. Eustace, “An Interesting Letter,” The Christian Science Journal 24 (May 1906): 65. A. P. Tonielli, “The earthquake and conflagration in this city of San Francisco,” Christian Science Sentinel 9 (Jan 5, 1907): 323. “Letters to our Leader,” Christian Science Sentinel 8 (June 16, 1906): 665-666.